Infant Community Orientation for Non-mobile and Mobile Infants. Attachment and separation are part of a process children must undergo from birth in order to become an individual: separate and be independent within the environment. Children from birth work towards independence and constructing themselves. In order to best assist your child towards being capable and building self esteem, we must provide a loving and supportive base for attachment. It is from this strong base they can reach into the world and detach to explore their environment. Starting in a new environment with a new caregiver can be hard on parent, child and guide. Arrivals and departures can also add stress to the group. Please plan to arrive 15 minutes early so you can help your child establish a routine for arriving and departing. The more confident you are in leaving the more confident your child will feel in being left. Once you leave, we ask you not to return as this causes undue stress on your child, the community and the guide. It is our expectation that you develop a sense of trust with our school prior to enrollment so you can model for your child a healthy experience to attending the infant community. Feel free to call and check on your child as much as you like. However, keep in mind our first priority is the children. When time permits we will check messages and call you back. When picking up and dropping off it is important to be sensitive to the community by creating the least disturbance in the room as possible. When other children see you, they are reminded of their own parents and may feel sad. Please enter our environments quietly, using a low voice as to be respectful of the children. 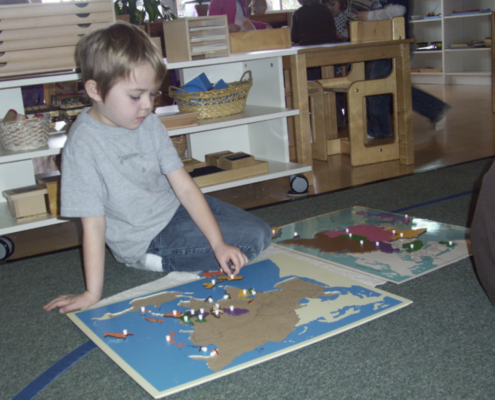 Montessori philosophy supports the natural development of the child. Our philosophy recommends that babies breast feed as the mother’s milk is most nutritious. When a parent plans to enroll their child in the infant community the parent needs to introduce bottle feeding at home prior to the enrollment of their child. Mothers are also welcome to come visit and nurse their child. Prior to the first day, parents meet with the lead guide to establish a routine that will help the infant to adapt to the Montessori environment. Parents need to make changes in routines at home prior to enrollment in a Montessori environment. Examples: from nursing to bottle feeding, allowing children to go to sleep unassisted. This will assist the infant in the smoothest possible transition process into a new environment and a new caregiver. It is crucial that families enrolling in the community follow the same philosophy to offer consistency in environment for the infant. For the first 6 months mother’s milk or formula provides all the nutrients your baby needs; however at about 4 months the baby will need a more concentrated source of calories. This follows the natural development of the child as the infant starts to get teeth. Once they have teeth this is the natural sign of the body that the infant is ready for whole foods. 4-6 months: This is when the weaning process first begins. First foods should be rice, mixed with breast milk, then single ingredient purees. Root vegetables, apples and pears are popular among infants. Other suggested foods are: papaya, banana, broccoli, carrots, sweet potato, squash and pumpkin. Initially these will be new tastes and your infant may choose not to try them. Wait and try again another day. Homemade infant food is best as it is most nutritious and does not have thickeners and additives. At Montessori of Alameda we serve only healthy snacks made of whole wheat ingredients, organic fruits or vegetables, nothing high in salt, sugar, processed or refined and NUT FREE. Due to the wide range of family preferences we do not serve animal products. Please refrain from sending jarred foods or processed and sugary or salty foods. It is our philosophy that all infants who do not support their backs independently will be lap fed. Once children can crawl over to the table and sit in the weaning chair they will be fed at a weaning table. By about 10 months mobile infants will drink from small glasses and obtain most of their nutrition from solid foods and liquids via a cup instead of a bottle. Per Childcare Division regulation, children over 12 months may not be fed by a bottle. We ask that parents support the philosophy at home to ensure that their child will be successful and happy at in a Montessori community. This can be done at home by allowing children to care for themselves and their environment as much as possible allowing them to do what they can do at their pace. Montessori of Alameda believes and practices the research of Emmi Pikler and Magda Gerber of preparing an environment where infants and toddlers can move freely without restriction or contraptions such as walkers, jolly jump-ups, playpens, cribs, highchairs. Parents who use these materials as a source of entertaining their child may find their child will have difficulty in a Montessori environment. The most important element in a baby’s environment is human interaction not objects. When choosing objects choose natural materials and simple items. It is natural and comforting for a baby to be carried, held, snuggled, but the adult must respect the needs to the child to explore, sleep, crawl and observe. Our rooms are simple and beautiful with pastel walls. We have floor beds where infants are placed on their backs so that they have a full view of their surroundings. Infants placed on their backs have the opportunity to explore their hands (their first toy) once they have explored their hands, they explore their feet and then master rolling over on their own. Our philosophy is to place objects near a child and then allow them to grab it if interested. We do not place objects in infants hands nor do we lay them under mobiles as to say “look at this”. Each environment is specially designed for a child to use the skills for the sensitive period they are embarking on. It is our philosophy to not place children in a position they can not get out of. For example: placing a child on its stomach before it rolls over by itself. Placing a child in a chair before it can crawl or climb on its own. Montessori of Alameda advocates allowing motor development to occur naturally in infants without adult interaction. For the infant this encourages active involvement, not passive. As the child develops self initiation, his intrinsic motivation to learn is encouraged. Having a child wear non-restrictive clothing. Young infants should not be swaddled or propped on pillows. Infants need to be barefoot to develop creeping and crawling skills over bridges and large motor equipment. The child should wear the least amount of clothing that the weather allows. An infants body self regulates temperature and just because an adult is cold does not mean that an infant is. Children do not need to be taught positions of movement (to sit or stand) and should always be places on their backs and not on their stomachs. Regressive behavior such as crawling and creeping is allowed even if the child is walking. Gross motor development is usually seen as when an infant reaches a milestone such as sitting, standing, walking etc. Whether he reaches certain milestones sooner or later is unimportant and trying to influence the process could be harmful to the natural development of the child. Allowing a child to move on its own will enhance the natural development and variety of its movements and over all development. Magda’s approach to infant education is to allow infants to do what they can do. RIE philosophy is that a child who is allowed to move freely develops a strong body and sense of balance. Developing good body image, spatial relations and a sense of balance not only helps a child to learn how to move but how to fall and how to recover. Children who are allowed to develop this way rarely have accidents. Parent’s who study RIE and Montessori soon learn that it is important for babies to have uninterrupted play and time to explore on their own. Children who have learned to be dependent on parents who entertain them or stimulate them lose their capacity to be absorbed in independent exploratory play that builds life-long problem solving skills. Parents soon become slaves to their crying/dependent infant that they themselves helped to create. Parents in our modern society spend much time buying new noisy, busy toys to entertain their children when what is really most important is care giving, everyday routines like dressing, bathing, eating. RIE philosophy is quality time over quantity. In order for infants to be happy in our environment we need the support of parents who are enrolling. We are looking for parents who are eager to learn how to help their child develop naturally on their own timeline as nature would allow them to do. If you are spending sleepless nights rocking and walking the halls to assist your child to sleep it will be difficult for your child to adapt to our environment. Infants need to be placed in their beds on their backs and allowed to fall asleep unassisted. Our school does not support the use of pacifiers as research shows that pacifiers are detrimental to an infants tongue development, speech development, creates dependency on a foreign object and does not allow the infant to find its hand to learn self-soothing techniques. At birth a baby already knows how to regulate his sleep for optimum physical and mental health. If we respect this intuitive knowledge after birth we are well along the path of preventing problems in sleep which often exhaust new parents and babies. We must be careful not to train a child to be dependent on us to go to sleep. When a parent quite naturally and out of feelings for love, always holds a baby until it goes to sleep, and then for some reason is unable to do so, the security is taken from the infant and she can become worried to go to sleep. It is natural for a baby to fall asleep while being held, rocked, nursed, etc. To prevent the creation of dependence on any of these situations, it is important that the child has a private space from birth on where she can go to sleep and wake up many times during the day and night on her own with feelings of security and happiness. Then the infant can stay in touch with its own natural rhythm and needs for sleeping and being awake. It is the parents responsibility to keep their child’s diapers, clothing, wipes and extra clothing well stocked. Please do not bring in more than what will fit in their cubbie. Your guide will show you how much room each child has to store belongings in the infant and toddler rooms. We do not have facilities for disposable diapers and request that parents supply the school with an all-in-one cloth diaper in which to send them home. A baby safe changing table is used to change and diaper non-standing infants. The changing table is disinfected in a sanitary manner after each use. Children who are standing are changed standing up. Guides wear protective gloves when handling body fluids of children. Floors and toilet seats are sanitized after assisting children in the bathroom. Guides practice hand washing after handling body fluids of children.